My husband and I are dreaming of having a beautiful house with patio and garden. 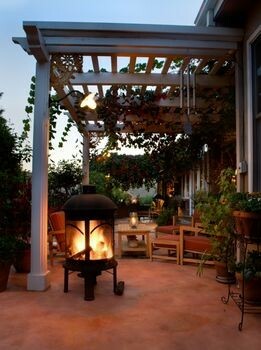 So when i stumble this photo of a beautiful patio i started day dreaming again. The cool breeze on a summer evening, while sitting in our garden and sipping on our favorite drink is indeed a delightful experience. How i want our patio would be? In decorating our patio, there'll be a rocking chair, some comfortable sofas for guests and a corner that our kids can call their own. To make the outdoor space as comfortable and calming as possible, i will buy outdoor furniture and cushions, flower beds, outdoor rugs and accessories.